After waiting 9 hrs to offer my perspective on legislation affecting the admissions process at the city’s specialized high schools (SHSAT), CM Dan @dromm25, chairman of the Council’s Committee on Education, wouldn’t allow me to speak because I refused to be sworn in. It’s an abuse of power to insist upon requiring members of the public to take an oath before permitting them to have their say. Yes, I made it a point of principle to refuse to be sworn in this evening. Earlier in the day, I tweeted that I would refuse to take the oath. I shared with Mr. Dromm my belief that he could not require me to take an oath to tell the truth because I am not the head of a city agency over whom he has oversight responsibility. I said that the oath requirement was an overreach and that I wouldn’t comply. After Dromm dismissed my panel, I rose from my chair at the witness table and walked to the Council dais to again inform Mr. Dromm that he was being abusive of his authority. Thereupon one of the Sergeant-at-arms whisked Dromm away and signaled for police assistance. Stunned, I told a plainclothes police officer that Mr. Dromm was wrong. The officer said that it was the Council’s rules and that I’d have to leave. I left without further incident. I hope that my stand will result in the City Council ending a pretentious practice instituted to make themselves seem a serious legislative body. 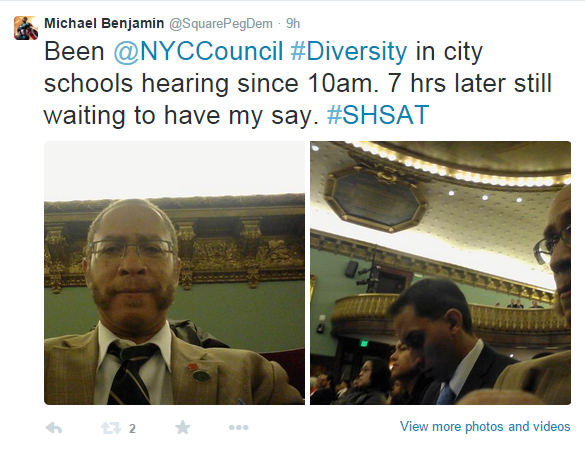 I live-tweeted my displeasure with CM Dromm’s treatment of speakers whose views supported retaining the SHSAT. My name is Michael Benjamin. I am a former state legislator and I am a proud alumnus of the Bronx HS of Science (Class of ‘76). And I am a recovering politician. Succinctly, I oppose Reso 442 and support as presently constructed the use of the Specialized HS Admission Test (SHSAT) as the sole criterion for admission to the City’s specialized high schools because the exam serves as a fair and unbiased arbiter of scholastic merit. The SHSAT entrance examination is the only truly fair and unbiased arbiter because every student admitted will have earned his or her place. The test itself is neither racist nor discriminates based on race or ethnicity. The much ballyhooed “disparate impact” on black and Hispanic students is not caused by the test. The test uncomfortably reveals the systemic disparities visited upon middle schools in black and Hispanic neighborhoods. Only 3% of black and Hispanic students scored above grade level on last year’s seventh grade math assessment test as compared to 31% of Asian American and 22% of white students. That is the heart of the disparity. I truly believe that the best way to aid the poor, black, Hispanic and underrepresented students is to commit significant resources to turnaround the low performing middle schools that for decades have ill-served vast numbers of those students. And to that end, the Council should direct and fund the Department of Education to create high quality gifted and talented academic programs in every community school district. Leveling the academic playing field should first begin by desegregating middle schools where possible, maintaining higher standards, implementing challenging curricula, and increasing academic supports in our low-performing middle schools (which are in predominantly black and Hispanic communities). Ending unequal middle school education should be your goal, not weakening our best schools and certainly not establishing an academically harmful minority quota system at those schools. I urge that the Council individually and collectively recall the despicable “gentlemen’s agreements” and changes in admissions criteria that once limited the number of Jews at elite US colleges and universities. Asian students and their parents are opposed to lowering standards or instituting quotas. They, in fact, feel targeted for being high achievers. Working class Asian families invest in their education and suddenly the City Council would penalize them for being “overrepresented” at specialized high schools. Lastly, I stand my October 24 op-ed wherein I described Intro 511-A as a Trojan horse disguising an attack on charter schools and the Asian students attending specialized high schools. The proposed admission criteria which range from administering the exam in five languages and adding an essay to using portfolios, attendance, grade point average, and extracurricular activities would favor non-Hispanic, white middle school students over Asians, Blacks and Hispanics. In fact, the number of minority students offered seats at specialized high schools while low has held steady for a decade. However, the number of white students has fallen by 40 per cent and 22 per cent at Stuyvesant and Brooklyn Tech, respectively. I urge this Council to forget race-based solutions and, instead, to focus on providing fiscal equity and academic solutions which will fix the dismal middle schools which are disproportionately located in residentially segregated black and Hispanic communities. Once we revamp the city’s middle schools, raise expectations and improve scholastic achievement, the number of blacks and Latinos at the very best public high schools will increase. New Yorkers of good conscience want merit, not race and class, rewarded at our specialized high schools. I urge you to withdraw from consideration Intro. 511-A, Resolution 453 and Resolution 442. This entry was posted in Education, Government and tagged danny dromm, Education, NY city council, shsat. Bookmark the permalink. I too was supposed to testify – I was also not able to present the testimony I had prepared. Even more egregiously, when I asked the clerk (hours into this) whether I could go across the street to get a coffee – I was told no problem, there’s an ed policy panel on and they won’t get to individuals for a while (even though I had been among the first to sign in for testifying). THEN – a whole group of use was barred re-entry to the building for almost an hour. I had left my belongings on a chair – no matter – we were out in the cold. In all senses of the word.